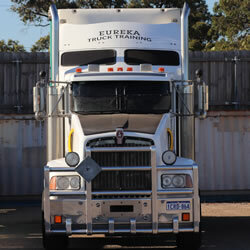 All Eureka Truck Driver Training is a Western Australian owned and operated business. 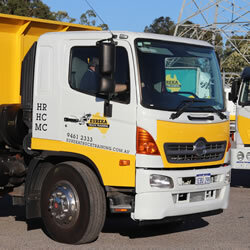 Eureka Truck Training partnerships with Registered Training Organisation No. 52488 (Eureka 4WD Training). The RTO, Eureka 4WD Training, will provide the Statement of Attainment upon successful completion of any of the training programs at Eureka Truck Training. 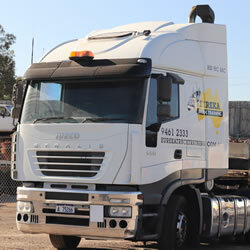 The team at Eureka Truck Training provide a personal and friendly approach. At Eureka Truck Driver Training we have the experience and knowledge to provide you with professional and top quality customer service. Our trainers are fully qualified, approved and have many years of heavy vehicle driving experience. They are patient and understanding to the different needs of all types of students, making you feel at ease while you learn all aspects of heavy vehicle driving. We have no set amount of lessons we require you to undertake, once both you and your instructor are confident you are ready to sit an assessment we make all the arrangements for you to do this. If you want to be professionally trained in all aspects of truck driving, then you are always welcome at Eureka Truck Driver Training. Please Note: You must be eligible to undertake training and assessment in the required class of heavy vehicle, please check your licence details with the Dept of Transport http://transport.wa.gov.au, or call them on 131156.